The image is enciphered using a discrete chaotic mapping function and a linear shift register. 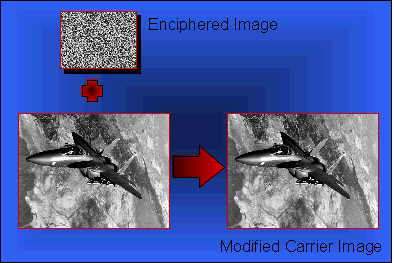 Then the enciphered image is hidden into a carrier image using the LSB method. The ciphering process involves mapping a lattice of pixels (the image) onto itself in a bijective manner. To accomplish this mapping, we use a discretized generalized baker map we slice the image into vertical slices and stretch and fold these slices before stacking them up on top of one another. In effect this creates a complex permutation wherein local and correlated pixels become uncorrelated and scattered across the image space. Extending the permutation into three dimensions, we modify our scheme to modify the graylevel of each pixels as they are chaotically mixed together. Therefore, any image, be it predominantly white or not, will be transformed into a chaotically-looking image with a relatively flat histogram. Deciphering an image is merely the inverse of the enciphering process. The high number of possible ciphering keys (i.e., number of ways to vertically slice an image) suggests that it would be very difficult to break the cipher by a direct search for the key. 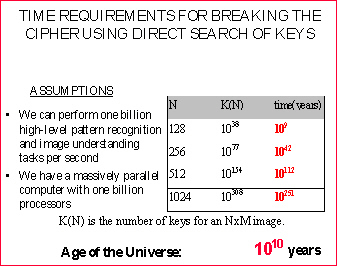 For example, a 512xM image would have 10^154 keys. A more formal crypt-analysis is currently underway. 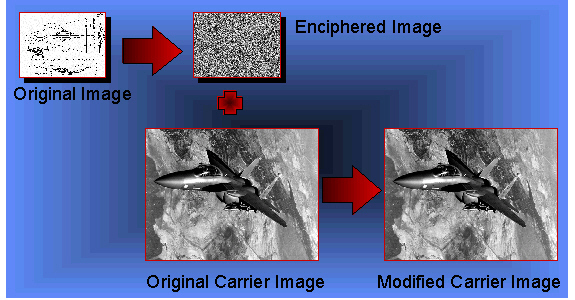 The hiding process involves modifying the least significant bit (LSB) of a carrier image to encode the pixels of the hidden message. Extracting the hidden image is done by merely retrieving the LSBs of the carrier image and rebuilding the hidden image. ï¿½ Fridrich, J. Secure Image Ciphering Based on Chaos. 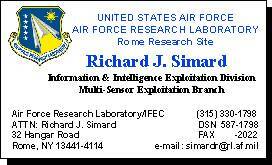 Final Technical Report RL-TR-97-155, Rome Laboratory, New York, 1997.
ï¿½ Fridrich, J. and Baldoza, A. Parallel Implementation of Chaos-Based Encryption Techniques. Final Technical Report. Rome Laboratory, New York. To be published. ï¿½ Fridrich, J., Baldoza, A., and Simard, R. On digital watermarks. Submitted to the Second Information Hiding Workshop, Portland, OR, 15-17 Apr 1998.